We're sorry, but we encountered errors processing your information. Please check below for missing or incorrect entries. 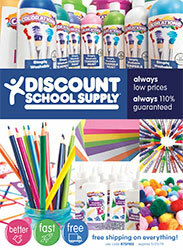 I would like to receive news and promotions via email from Discount School Supply®. I would like to receive articles, crafts and other tools via email from Earlychildhood NEWSlink. *Please select the catalog(s) you would like to recieve. Our specialty catalog devoted to your littlest learners. Shop cribs, buggies, playthings, changing tables, soft play, books, music and more, all for infants & toddlers. Build a better classroom. All the furniture and equipment you need to foster a safe, efficient and functional learning environment. This catalog includes furniture, storage, and carpets in addition to rest mats and cots.